About "Classic definition of probability"
Let us consider a random experiment that result in a finite elementary events, which are assumed to be equally likely. Probability is defined by the ratio between the number of favorable outcomes to the number of all possible outcomes. Let A be the event in a random experiment. n(S) = Number of all possible outcomes of the experiment. Here "S" stands for sample space which is the set contains all possible outcomes of the random experiment. To have better understanding of the above formula, let us consider the following random experiment. A coin is tossed once. Let A be the event of getting head. For this definition of probability, we are indebted to Bernoulli and Laplace. This definition is also termed as a prior definition because probability of the event A is defined on the basis of prior knowledge. (i) It is applicable only when the total no. of events is finite. (ii) It can be used only when the events are equally likely or equi-probable. This assumption is made well before the experiment is performed. (iii) This definition has only a limited field of application like coin tossing, dice throwing, drawing cards etc. where the possible events are known well in advance. In the field of uncertainty or where no prior knowledge is provided, this definition is inapplicable. In connection with classical definition of probability, we may note the following points. (a) The probability of an event lies between 0 and 1, both inclusive. When P(A) = 0, A is known to be an impossible event and when P(A) = 1, A is known to be a sure event. (b) Non-occurrence of event A is denoted by A’ and it is known as complimentary event of A. The event A along with its complimentary A’ forms a set of mutually exclusive and exhaustive events. (c) The ratio of no. of favorable events to the no. of unfavorable events is known as odds in favor of the event A and its inverse ratio is known as odds against the event A. Let M be the number all possible outcomes of a random experiment and Mₐ be the number favorable outcomes of the event A. Therefore, odds in favor of A and odds against A are the two ratios which are inverse to each other. When a coin is tossed three times, first we need enumerate all the elementary events. Hence the elementary events are HHH, HHT, HTH, HTT, THH, THT, TTH, TTT. Out of these 8 outcomes, 2 heads occur in three cases namely HHT, HTH and THH. 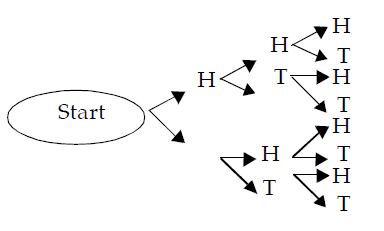 If we denote the occurrence of 2 heads by the event A and if assume that the coin as well as performer of the experiment is unbiased then this assumption ensures that all the eight elementary events are equally likely. Let B denote occurrence of at least 2 heads i.e. 2 heads or 3 heads. Since 2 heads occur in 3 cases and 3 heads occur in only 1 case, B occurs in 3 + 1 or 4 cases. After having gone through the stuff given above, we hope that the students would have understood "Classic definition of probability".